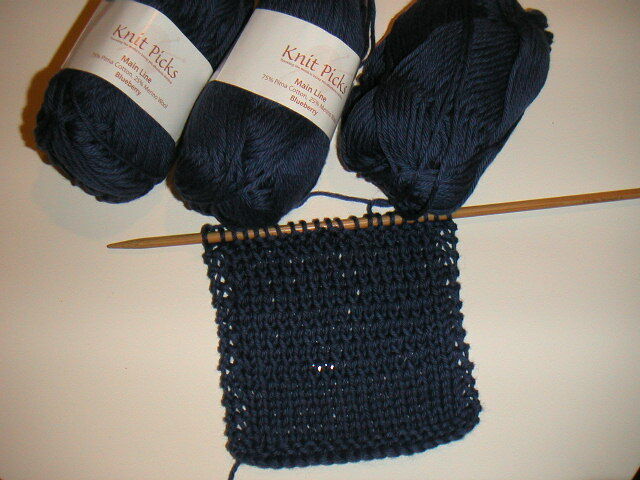 I received my KnitPicks Mainline yarn in the mail yesterday and promptly knit up a swatch. I had to go up a couple of needle sizes from what was recommended, but the fabric looks fine. For the second half of my swatch, I knit using a crossed stockinette stitch, which is knitting through the back loops on all right side rows. After seeing the swatch, I decided to use this stitch for the Blouson instead of reverse stockinette, which I hate. I figure the crossed stitch will be a little more interesting than just plain stockinette and it gives the fabric a nice texture. I haven't knit for a while and it felt good to pick up the needles again.